Minister for Women, Children and Poverty Alleviation Mereseini Vuniwaqa (left). Women living with disabilities have an allowance to cater for their needs, says Mereseini Vuniwaqa. This statement, made by the Minister for Women, Children and Poverty Alleviation, was during the United Nations 62nd session of the Commission in the Status of Women in New York in the United States yesterday. Ms Vuniwaqa was able to deliver Fiji’s statement before the Commission chair, Geraldine Byrne, from Ireland and delegates in the session. Ms Vuniwaqa said that rural Fijian women make up to 48.1 per cent of the rural Fijian Population and 21.2 per cent of the nation’s population. 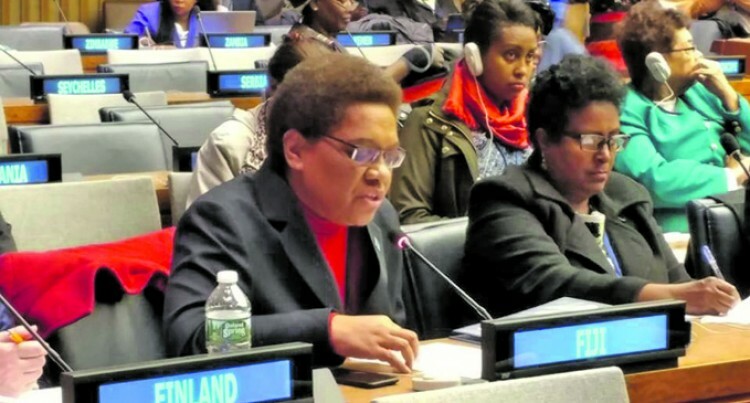 “When we consider the fact that Fiji is made up of over 300 islands and that rural women and girls reside over at least a hundred of those islands, accessibility and connectivity to services becomes a critical consideration,” Ms Vuniwaqa said. “Investment in social protection has ensured that elderly women who have no superannuation, not having worked in paid employment their entire lives do still have access to a pension. “It ensures that single mothers, who have no source of income, receive a stipend to assist in looking after their children. “It ensures that women living with disabilities have an allowance to cater for their needs.” Ms Vuniwaqa said. She said the Fijian Government has taken relentless effort towards the empowerment of the rural population, including women and girls, with its unprecedented investment in infrastructure development in rural areas, legal reforms to repeal gender discriminatory laws and access to justice initiatives particularly targeted at the rural population.